Gainesville native Tom Petty, whose current album "Full Moon Fever" has sold more than a million copies, is coming home for the first time in nearly seven years. Petty and his band, the Heartbreakers, will perform in the O'Connell Center Jan. 27 at 8 p.m. It will be the first time since Petty and his fellow musicians -- three of whom are also from this area -- have appeared in Gainesville since February 1983. Petty left Gainesville in 1974 after years of playing in local nightclubs. With the Heartbreakers, he has recorded a series of best-selling albums, including "Damn the Torpedoes," "Hard Promises" and "Southern Accents." In 1987, he joined forces with George Harrison, Bob Dylan, Roy Orbison and Jeff Lynne as the Traveling Wilburys. The resulting album, "Volume One," has appeared on many rock critics' lists of the decade's best. 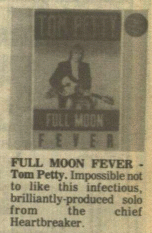 "Full Moon Fever," recorded without the Heartbreakers, reached No. 3 on the Billboard magazine chart and has since become the biggest seller of Petty's career. Reserved-seat tickets will go on sale Jan. 10 at Ticketmaster outlets. They will cost $14 for University of Florida students, $18 for others.